This past weekend, I attended the New York Comic Con and had the good fortune (and swift feet) to catch the first 18 minutes of the upcoming Watchmen, an exclusive (to the Comic Con) 2 minute scene and a public Q & A with Watchmen artist Dave Gibbons. The movie opens with the fight between the Comedian and his mystery attacker (SPOILER ALERT it’s Patsy Ramsey with John out in the hall writing the ransom note). The scene, which is not included in the novel, is flooded by Zach Snyder’s slow-motion edits. While some argue that the slow-motion cuts are punctuations to the fight, it’s like that Seinfeld where Elaine places punctuation marks at the end all of Jake Jarmel’s sentences (“It was cold outside! I grabbed my sweater!”). Fight aside, the opening montage, while potentially confusing unfamiliar to the series, set to Dylan’s The Times They Are A Changin’, is a phenomenal sequence, which shockingly left me amazed. The vision of the sequence let me immediately forgive Snyder’s poor fight sequencing, and for a moment, made me wonder if this could be as great as the novel. The extra 2 minutes is the scene where the squirrelly Rorschach, unmasked, imprisoned with the fifth he has been fighting for years is being hassled in line by the other inmates and reacts in pure Rorschach style. As Jackie Earle Haley, who clearly understands the character, delivers the famous “I’m not locked up with you, you are locked up with me” line, I shuttered in intimidation. During his introduction of the clips, Dave Gibbons said the point of showing the 18 minutes was to wet the appetite. 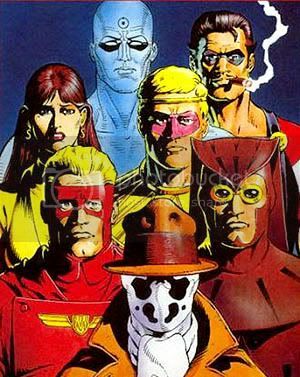 While Watchmen will most likely have its flaws, I cannot wait to dig in on March 6. Were these perhaps the same 18 minutes that went missing from Nixon’s recordings?